I hadn’t planned on doing another ID Challenge so quickly after the previous one¹; however, this critter is just too cool to keep in my pocket any longer. Order-level identification shouldn’t be too much of a challenge, but I’ll be impressed with anyone who drills down much deeper than that – 2 pts each for correct order-, family-, genus-, and species-level identifications. What the heck – I’ll go ahead and throw in superfamily as a points-earner as well. Supporting information for your IDs will help your cause, and we all know my predilection for handing out bonus points on the most subjective of bases. As always, standard ID Challenge rules apply. ¹ For those of you wondering about the recent flurry of posts, I’m on a well-earned vacation right now and have pledged to fritter away as much time on idle pursuits as possible rather than fret about accomplishing anything constructive. Not Coreoidea, but I’ll give you a consolation point for implying order Hemiptera. Well, that’s a very cool bug (Hemiptera). If I had to guess I’d say Pentatomoidea going just on the over all gestalt. Family? Hmmm no clue, but maybe Pentatomidae just to throw a guess in. Very cool find whatever it may be! Ok, last second idea: Scutelleridae? Nope, not Scutellaridae either (that was what I was thinking when I first found it). Yes, Hemiptera and Pentatomoidea, but not Pentatomidae – 4 pts. It’s one of the wierd stinkbugs with the bizarrely enlarged scutellum. 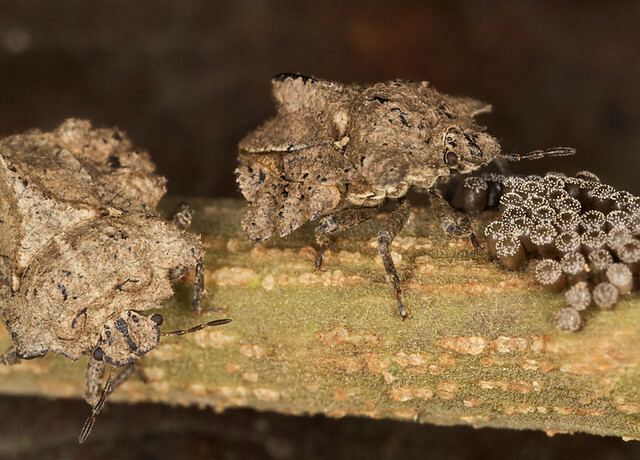 I’ve collected them in Costa Rica (and may still have them), but not sure I ever got an ID from Dave Rider, the stinkbug guy. 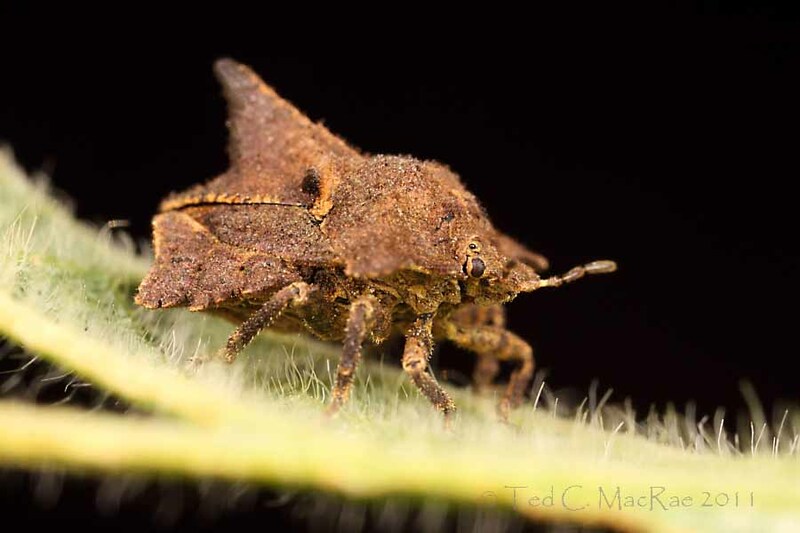 Well, if by “stinkbug” you mean Pentatomoidea then yes, but it’s not one of the true stink bugs (family Pentatomidae). Normally the taxon has to be stated to get the points, but since you’re new to this I’ll give you credit for the order (Hemiptera) and superfamily (Pentatomoidea) – 4 pts. The leaf fuzz looks like a less-magnified version of the fuzz in the thrips pictures, so I’m guessing that this one was also on your Argentinian soybeans at about the same time. I think the scale would therefore be somewhere between 5 and 10 mm, so this is not tiny, but not huge either. Yes, this was taken on soybean in Argentina – a nice deduction that earns you two nifty bonus points. Otherwise, your IDs are correct for Hemiptera and Pentatomoidea, but it is not in the family Pentatomidae. 6 pts! This one is too tough. Based on the rostrum visible under the head and the antennae, this is order Hemiptera, suborder Heteroptera. Presumably the blurry bits on either side of the head are projections of the prothorax and there appear to be similar projections from the abdomen. To my knowledge, this occurs in some Aradidae and Pentatomoidea. Some aradids hang out on the outside of bark, and they may be cryptic like this, but the bug seems too three-dimensional to be an Aradidae (and what would one be doing on a leaf)? Too tough, huh? Your IDs are correct all the way to genus (thank WordPress for its technical difficulties that prevented you from punting). Too bad you didn’t Google Cytocoris, as that would have led you to the recent revision of the family (Packhauskas and Schaefer 1998) and a specific ID of C. egeris. Still, 8 pts gives you not only the win for this challenge but also some breathing room for your lead in the current session overall standings.